Chimpanzees are usually two and a half to four feet tall. Their bodies are covered with brown hair. Their faces ears, and hands are either pink or black. They have hands very much like those of humans. When they live in the wild they are most commonly found in West and Central Africa. Chimpanzees eat a wide variety of foods. They eat different kinds of fruits, nuts and seeds. They also sometimes eat meat, they are omnivorous animals. Chimpanzees like to live in rainforests but can be found living in other kinds of forests as well. 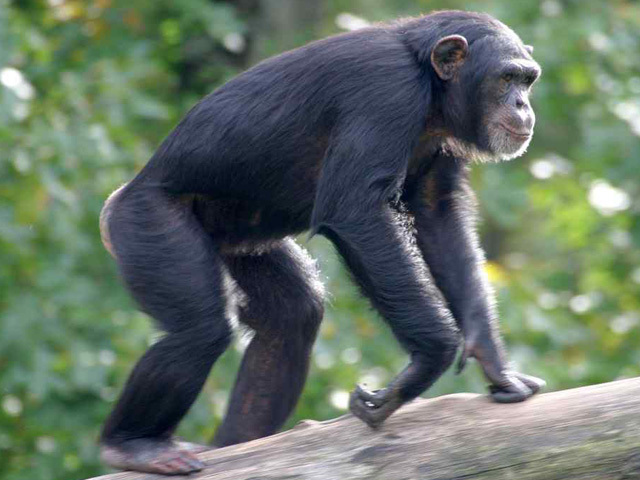 Chimpanzees are an animals who make and use tools. Some chimpanzees that live in captivity have been taught to speak in American Sign Language. They not only are able to communicate with humans this way but have been seen teaching American Sign Language to other chimpanzees.